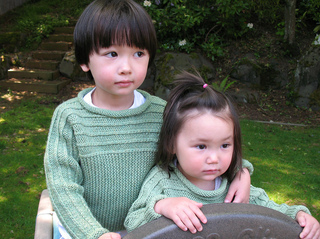 This adorable unisex child’s pullover (sized for ages 4 through 10) starts at one cuff and works across the body to the other cuff edge. 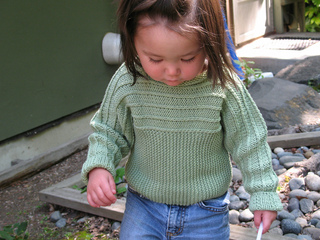 The sleeves and top half of the body are worked in a twisted stitch that runs across reverse-stockinette stitch, and the lower half of the body is worked in an easy garter stitch. Note error: First sentence under “Body” should say “…work in pattern to last 7 (7, 7, 9) stitches,….” Also, under “Right sleeve” you should reverse the shaping done on the left sleeve to insure that the sleeves match.